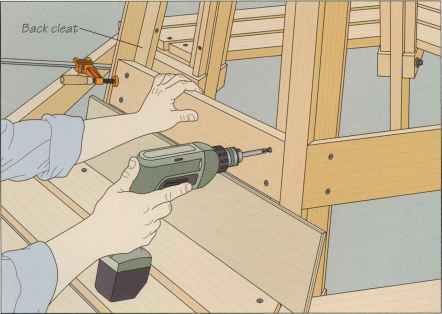 Drill two clearance holes at each end of every back slat. Using the spacer to separate the slat from the seat slat below and a clamp to hold the slat level, fasten each piece to the back cleats (right). 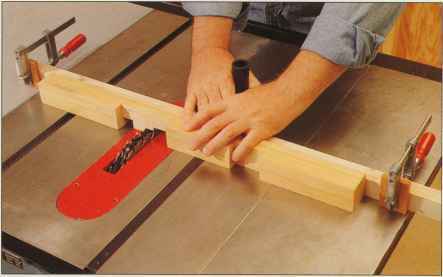 Install the second and third tiers of back slats the same way, but use a %-inch-thick spacer to separate the board edges. Apply your finish before setting up the bench in its chosen location outdoors and so avoid splattering the tree with paint, stain, or varnish. Before transporting the bench, remove the cap rail, apron and slats from two opposite sides of the assembly. This will leave two pairs of frame sections that, together with the removed pieces, are easy to move. Once the two frame sections are positioned around the tree, you can reinstall the detached boards (photo, page 77). 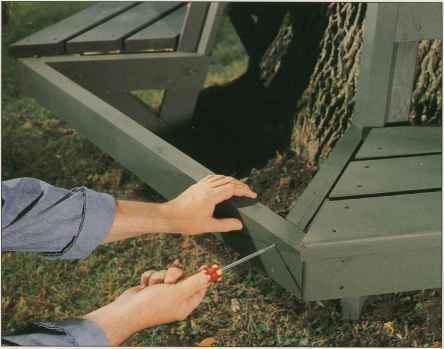 With two double frame sections positioned on opposite sides of an ash tree, a tree bench apron is fastened in place. Since the bench was built in the shop and disassembled for easy transport and positioning, installing the remaining pieces—the seat and back slats, the cap rails and the last apron—is a simple matter. The boards can befitted into position and the screws driven into theirpredrilled holes.